Daihatsu EFCS, EFVS EFNS S80 & 100 Series Intake Manifold Gasket. Also fits Daihatsu Midget EFCK & EFSE Engines. 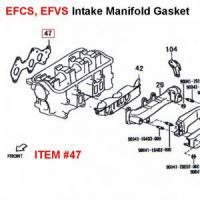 Include VIN number when ordering Daihatsu EFCS, EFVS EFNS S80 & S100 Series Intake Gasket. OEM PN: 17177-87213 Fits Both Truck & Van. Item #47 in Diagram, other components sold separately.